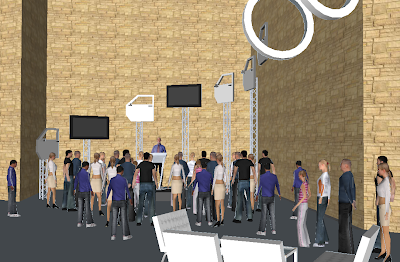 exhibit and interior design solutions. Based in Sydney for local and national clientele. 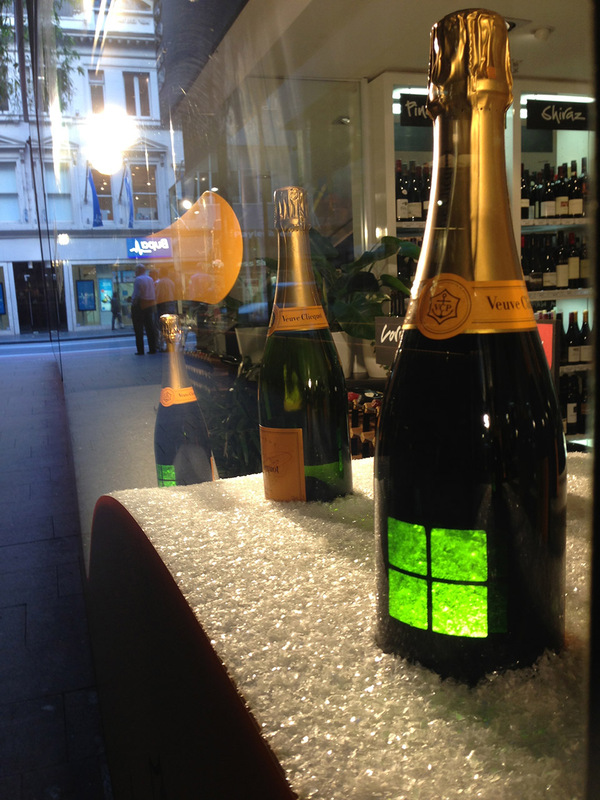 When the Trade Marketing team approached Objet Bart in 2012 to look at display design projects for 2013 it was an ideal opportunity to build a solid relationship with a well positioned client, Moet Hennesy. 6 months later and we have installed our first successful display and about to do our second. They are both at the high profile Ivy Bottle Shop, part of the Merivale Ivy complex, 1 Palings Lane, 320 George Street in Sydney. 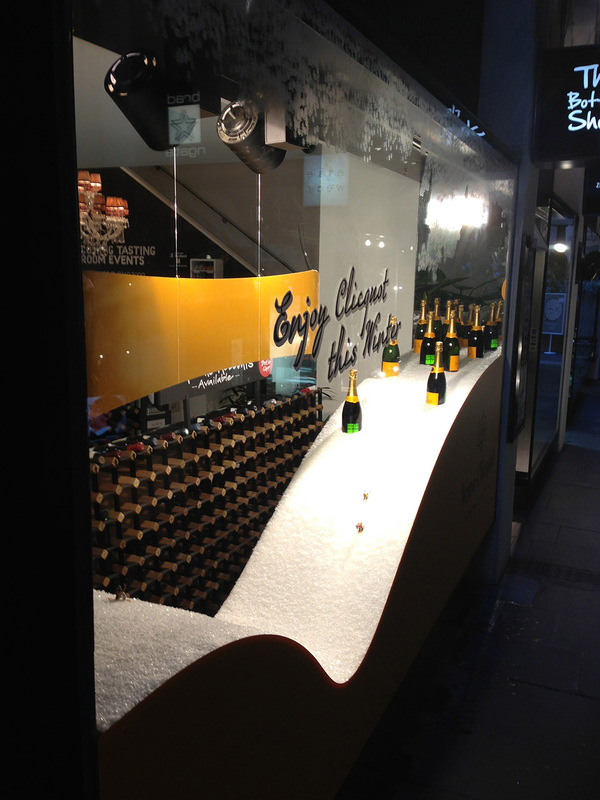 For the first custom display we took the Veuve Clicquot winter theme and created 3 dimensional approach rather than simply dressing props in the window. We produced pictures and movies to show our concept in 3D to the client via internet. 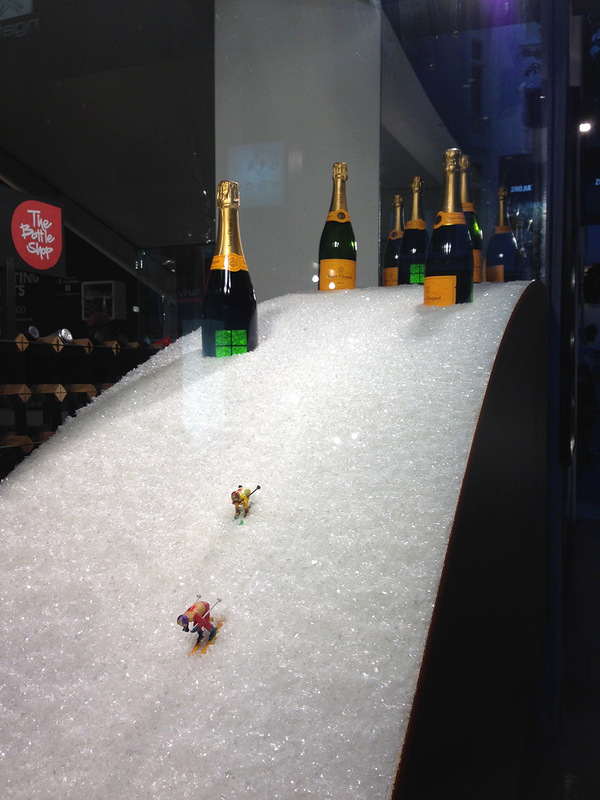 The bespoke model ski slope, (complete with snow and skiers and illuminated chalets made from adapted Veuve Clicquot bottles) were built at the Objet Bart workshop in Alexandria. This eye catching display has been seen being snapped by tourists and locals alike and has received excellent feedback from client and venue alike. Stay tuned for a blog on our Dom Perignon display in July. 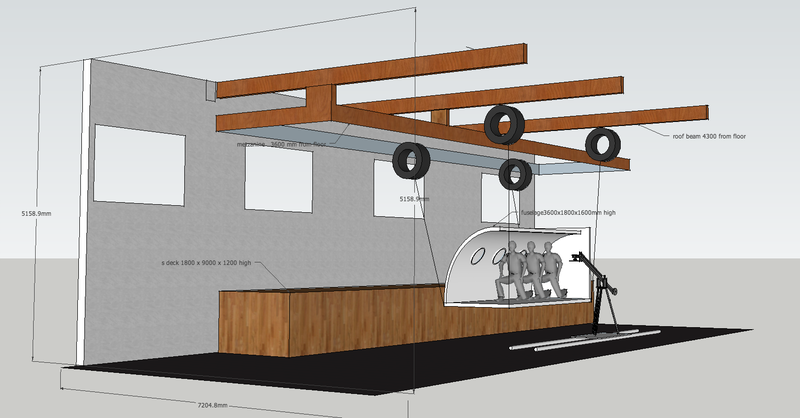 Contact Objet Bart to service your bespoke merchandising display requirements. 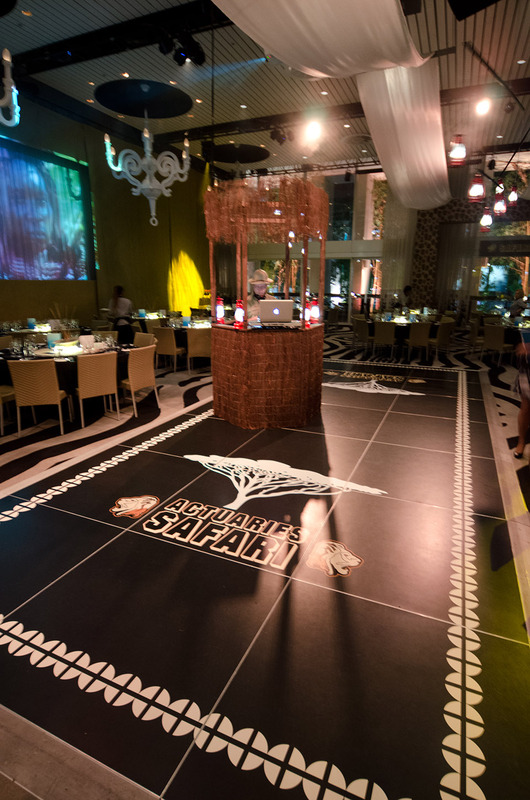 When the Actuaries Society of Australia decided they wanted a Safari theme at the Ivy Ballroom for their dinner during the annual summit, it provided a rare chance to design a large scale themed dinner from scratch without taking the hired option. We custom printed 500m of fabric in a rock pattern to make large arch entries for the Ivy Ballroom. We imported 70 hurricane lamps, painted them red and inserted fairy lights so that we could suspend them on turning mobiles from the ceiling to create a moving field of stars. 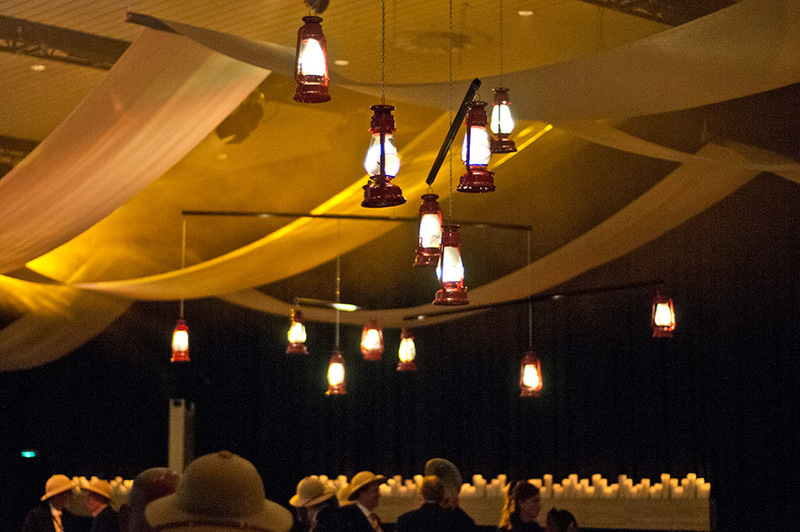 We created table centres from hand pick grasses and upturned pith helmets that glowed on the custom stencilled timber table tops. We covered a 30 meter long wall of the Ivy Ballroom with canvas and projected wildlife savannah images through the gaps. We made custom rustic booths for the bar and DJ around which African drummers got 340 pith helmeted actuaries to do a tribal version of the Macarena. Needless to say a good time was had by all. 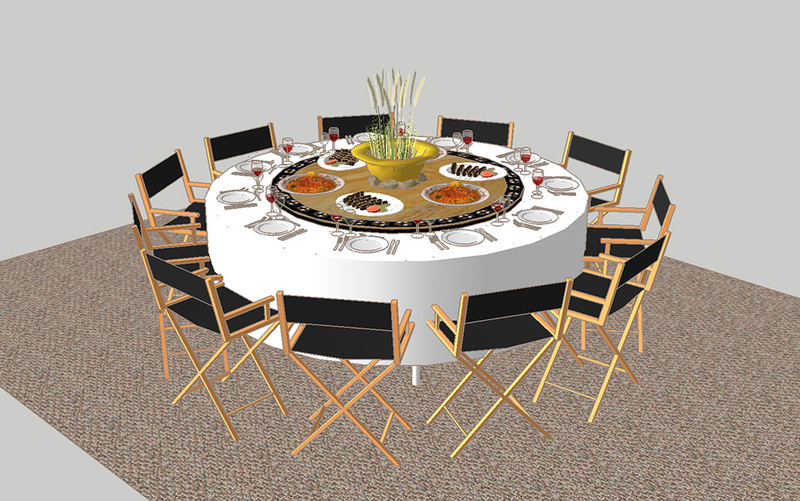 Contact Objet Bart to service your event design requirements. In July luxury car brand, Audi launched 2 new models to the Australian media in Hobart. Objet Bart was invited by Audi's Corporate Communications Event Executive to provide a unique sculpture inspired designed installation to enhance the media experience in a style sympathetic to the location, the world renowned private art museum MONA, in Tasmania. 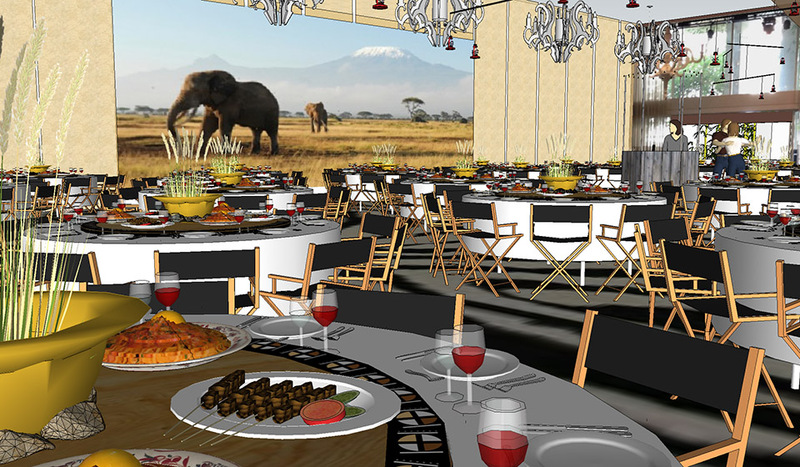 After a site visit with client, we presented an initial concept proposal which was then approved with 24 hours as the turn around from initial contact to event was only 10 days. Objet Bart then arranged local construction support to assemble and prepare the elements in Hobart within the remaining 5 day period. The design discretely incorporated core Audi values with its logo and spoke symbolically of both the long history of the brand and more importantly, its dynamic future.Objet Bart conceived and designed 3 integrated elements symbolically looking to both the past and the future of car design through the Audi brand. We researched and constructed a series of timber 'car door' shaped panels chronicling the evolution of Audi car design by their shaped and corresponding dates creating a flock of panels suspended from 20m of suspended truss, and complemented by a series of automotive soundscapes and a dedicated light rig inside a natural stone corridor 9 m high and 40 m long. We then arranged this flock of door panels to flow through 4 large suspended silver rings, clearly referring the the Audi Logo. The composition then transformed into a series of 5 Audi door blanks which Objet Bart modified and were mounted on truss uprights so that they spiralled down around the speaker podium. The brief required sensitivity to the museum environment, both visually and logistically as the designed solution involved more than 20m of suspended truss, soundscape elements, and a dedicated light rig inside a natural stone corridor 9 m high and 40 m long. 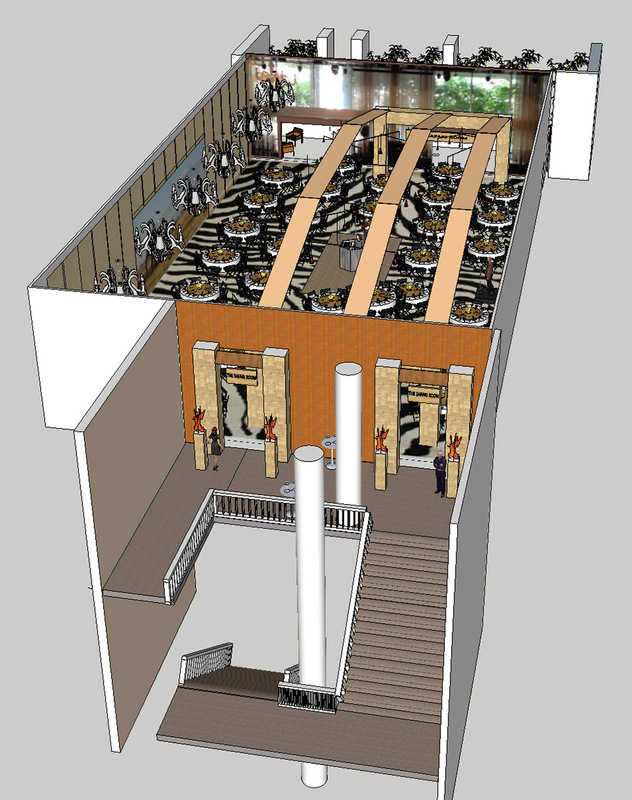 We worked closely with their staff in installing this large scale sculptural solution. Set construction for 60 minutes TV re enactment "One Way Ticket"
Set construction for TV re enactment "One Way Ticket"
60 minutes contacted Objet Bart through EEgender Films to design and construct a custom build of a plane fuselage set for a fatal crash re enactment. It was quickly agreed that to control the budget and expand the potential of the special effects suspended set, we should build as well as shoot in our workshop in Alexandria. In order to visualise the set, we drew up 3 dimensional graphics to illustrate the dynamic functionalility of the floating set for the producers and the stunt co-ordinator,Grant Page. 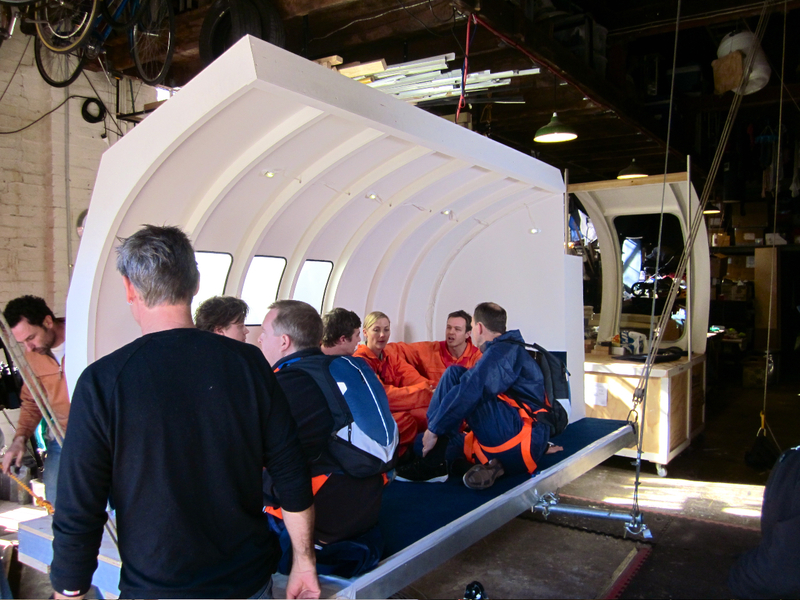 Objet Bart drew on its experience in TV and film design and art direction, constructing a suspended platform with ribbed half fuselage, fully lined and detailed. This was all based on consultation with the client, research from archival media material and aviation safety reports of the incident. 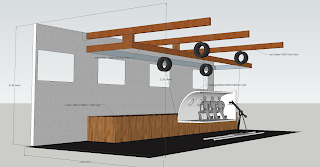 With only a week from design to shoot, effective collaboration with the client and director and clear visual communication was the key a smooth build and detailing period delivered on budget and on time. 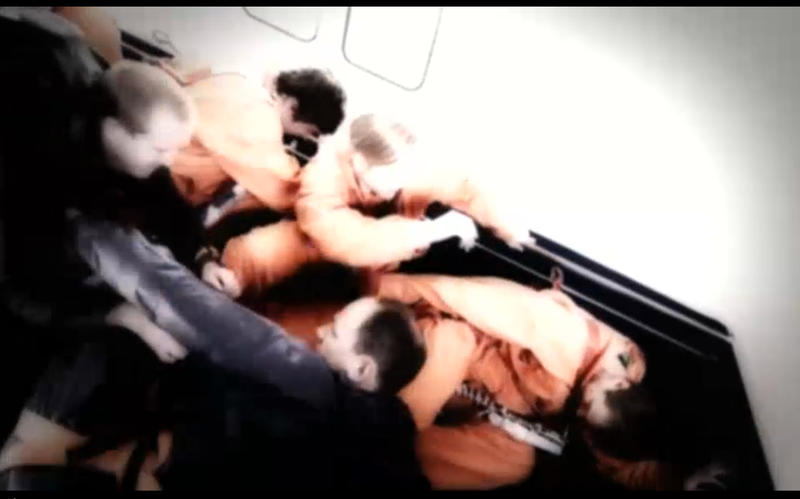 On the day the stunt team, actors, and film crew got the scene with no bruises. Contact Objet Bart to service your small to medium TV productions requirements. After such a successful response to our work last year, Vivid Sydney once again invited us to deliver and instal and the retail material to promote Vivid Light Festival this year. We covered almost 300 retail outlets, restaurants and public spaces in 10 days, around the Rocks, Circular Quay and Walsh Bay precincts. Working closely with the team from Destination NSW and Cre8ion Events, we effectively 'tagged' the area with blue corners and logos. 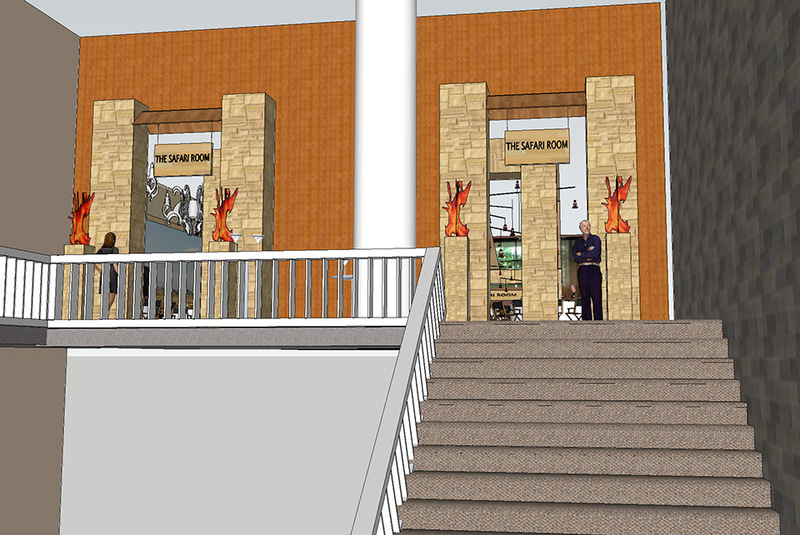 As you can see in the pics below, we even exploited their graphic concept in ways that even made the management smile.